The fifth generation Chevrolet Bel Air was built on GM's B-body platform that included big sedans like the Chevrolet Impala, Buick LeSabre\Invicta\Wildcat, Oldsmobile Dynamic 88 and Pontiac Parisienne\Catalina\Laurentian\Bonneville. The Bel Air was the middle of Chevrolet's mid-size product range and this next example looks like a pretty interesting hot rod custom. 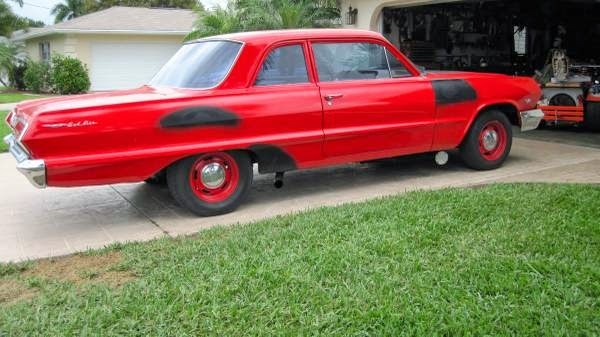 Find this 1963 Chevrolet Bel Air Gasser offered for $12,500 in Cape Coral, FL via craigslist. Tip from Dascpcu. 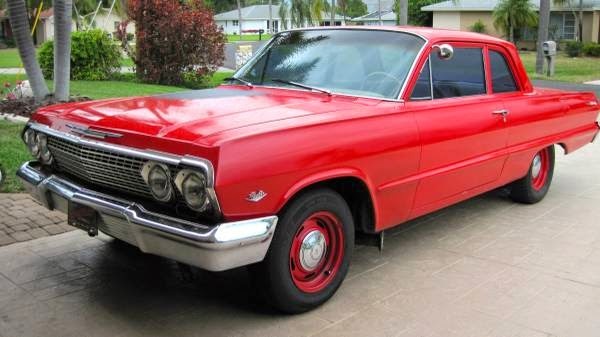 This Bel Air looks to have the good bare bones of a stock car style build -- a 300 horsepower 327 with exhaust cutouts, 4-speed Muncie, and simple rally wheels. 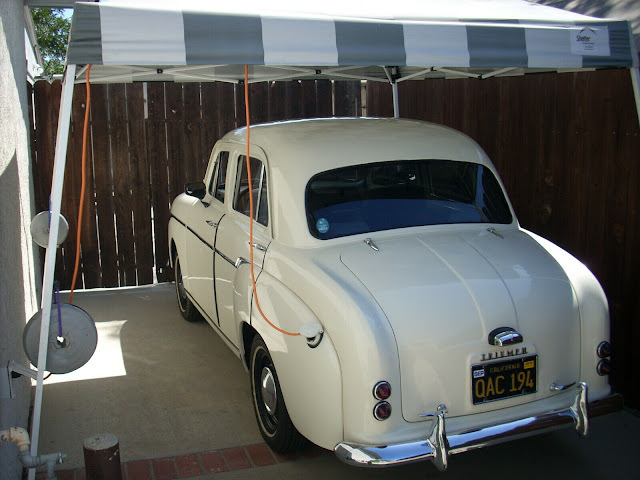 The seller admits the car is in need of some restoration, but it doesn't look bad from a mechanical perspective. 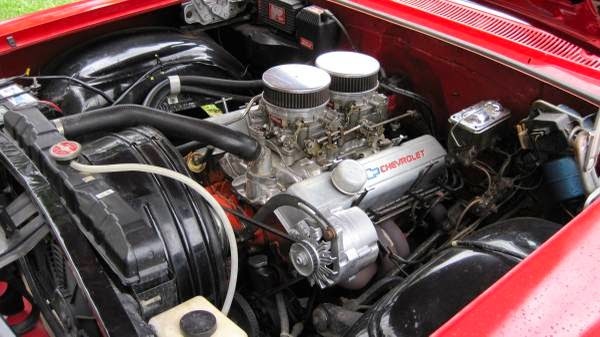 Under the hood is a 327 cubic inch version of Chevrolet's legendary small block V8, this was the engine that built the small block's reputation before the ubiquitous 350 cubic inch version became the norm. The 327 was used in all sorts of GM product, including some hopped up versions in the Corvette, so don't think its slightly smaller displacement will be much of a hindrance to making power. This car with a V8 weighed 3,345 lbs. when shipped. Building this engine with a strong hydraulic cam, flat tops, double bump heads and some headers should yield 1 hp/cu in. And, as everyone knows, 10lbs/hp is where the fun starts. I'd dump the dual quads and throw on a Holley Spread Bore with a good manifold just to keep the thing from eating me out of house and home. Is this the Prelude from '63? Is a mid sized 2 door with mediocre performance (un-enhanced) collectible? It seems a car with big production numbers and bad paint should have a lower price tag. With a dab of paint this thing could possibly bring $25k up here in eastern canukistan. That's how these things work here, buy at a decent price do very little and crank the price by 45 to 50%.